Weekend Catch-up: What a patriotic vaca! I’m rather devistated that my vacation is coming to an end and I will end up at work tomorrow. SAD. PANDA. But such is life. While my original plans for the fourth revolved around sitting on a beach and drinking alcoholic beverages, the actual plan was just as hot but also just as fun! One of my good friends lives in downtown DC and invited Catie and I down to her humble abode to eat, drink, and be merry! 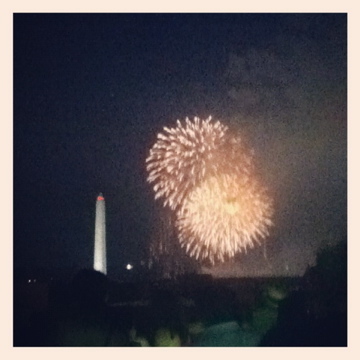 And watch the fireworks from the national mall of course. The night before, I ended up getting locked out of the house I was watching with nothing but myself and a pair of flip-flops. I felt so guilty for not having watered the flowers (even though it had rained) so went to do so, ended up locking myself out and in a thunder-storm… because that is my luck. Luckily the neighbors were generous and let me use their computer to send out a dramatic “HELP ME!” message and call my parents to come get me. It was extremely dramatic and the only thing that I could think of (and relate to, as I sat outside in the pouring rain and lightening) was Mia in “Princess Diaries” when her car breaks down in the rain-storm. Yeah, that is my life. Anyway, I was excited for something to finally go as planned and it did! Catie brought me back to the house (my biffle is amazing) and we took my car to park at my office and take the metro into the city. Yas made a lot of amazing food and it was a great time of chatting and catching up with everyone. At night we went up to the roof to watch the fireworks. We had an amazing view! All in all, everything turned out well and the way it should have. 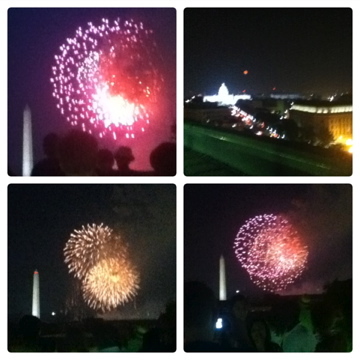 You really can’t tell from the pictures, but we were smack dab in the middle of the two iconic figures in DC. It was very cool and we all had a lot of fun. I even got to wear my shirt! 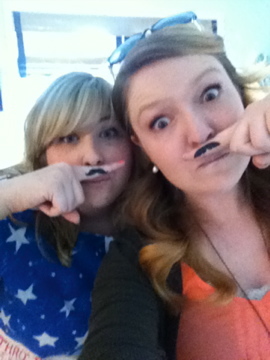 And of course, no holiday is complete without adorning a mustache! I took off of work the rest of the week since the holiday fell oddly on a Wednesday. I was pretty spoiled as we had off on Monday due to power outages, but I kept the “stay-cation” in play just for a break. I have since remembered why I do not take vacations regularly: I have the WORST time getting back into a routine when I’ve been lazy. Boo. 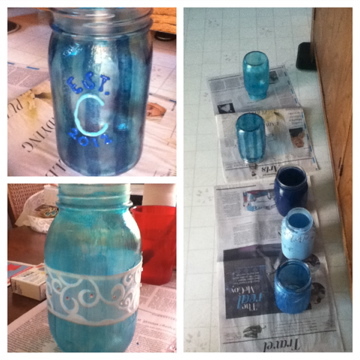 Anyway, Friday I went over to my sisters to do some crafting for her party in August! 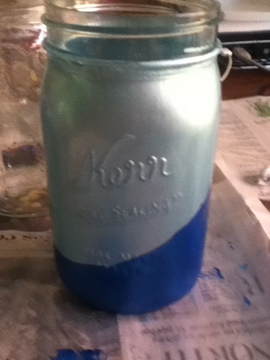 We’re making all kinds of different mason jars for people to use as cups. BEHOLD our creations! Only some of our creations. The left two I made, the first like a baseball uniform and “Est. C 2012” as her new last name starts with C. The second I used another round of glass staining, some ribbon and some jewels. 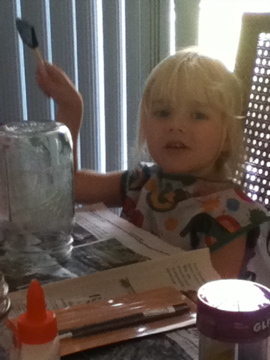 Even Zoe got in on the action and made her own! It was very cute! 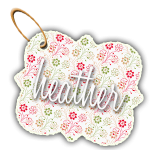 I have a few other crafts going on currently that I’ll be posting this week! Again, hope you all had a great holiday! Weekly What?! How did I not know about this store?! I love that you referenced The Princess Diaries!! Thanks on the jars! Will be posting more in the near future!